Beyond the banners draped over storefronts and hung in restaurant windows; beyond the window paint. 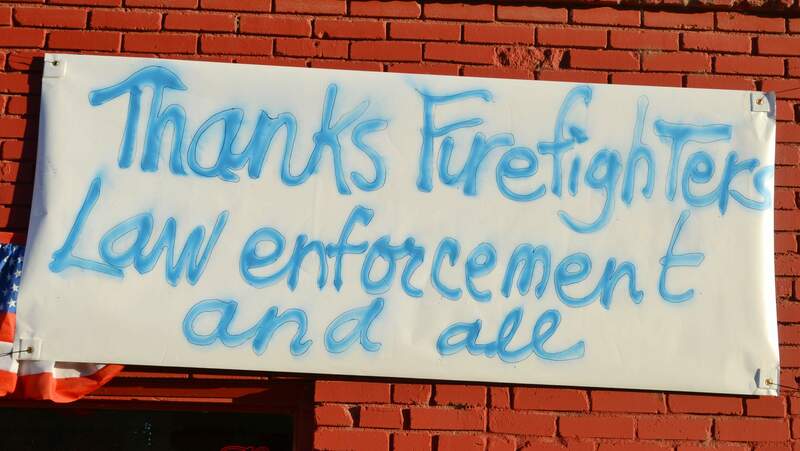 Beyond the hand-painted signs on fences and leaning against mailboxes on county roads, there is a level of gratitude this community feels for all those involved in the fight against the 416 Fire that is difficult to convey in just three words. “Thank you, firefighters,” says a lot, but it doesn’t say nearly enough. Not when we consider that nearly 1,000 crew members from across the country were on the lines at the height of the fight, and when we acknowledge the skill and courage of the aircrews that made flight after flight in fixed-wing and helicopter tankers. That statement should include every member of the ground crews who fueled the aircraft and kept them supplied with retardant and the mechanics who kept them flying. We hope they know it. Thank the firefighters, yes, but we also acknowledge and thank everyone involved, at every level – from La Plata County Emergency Manager Butch Knowlton and his staff; La Plata County Sheriff Sean Smith and all in his office; the San Juan National Forest and additonal USFS crews – and of course our area fire districts and personnel. We also thank law enforcement officers from our local communities (and agencies across the state) who helped wherever needed, including the evacuation process from first notifications until residents were allowed home. Colorado State Patrol personnel and crews from CDOT were joined by Durango Police Department officers and officers from towns and cities near and far to manage the tricky and constantly changing status of U.S. Highway 550 during the days and nights when the fire threatened to jump the pavement and consume the many residences to the east. We are thankful as well for the competency and training of those who directed the efforts, especially all who managed the smooth transitions from our local county Interagency Incident Management Team through three additional national firefighting organizations as the fire grew in size and destructive potential. While the fire raged, on its way to consuming over 50,000 acres of forest, those directing the efforts to tame it never skipped a beat or became distracted by questions of responsibility or authority. That not a single structure has been lost to the 416 Fire is a testament to those transitions. As an editorial board, we also thank the Herald’s “better half,” our reporters and newsroom staff who worked as tirelessly as the fire crews to keep local residents and the entire state updated – both in our print editions and online – with the latest news on the fire and the evacuations. They provided, and continue to provide, some needed clarity through all the smoke. We are especially grateful to photographer Jerry McBride, who captured the fire in all its terrifying power, but at the same time, with images showing structures saved by firefighters, provided hope as well. Few stories have emerged from the 416 Fire that express both the loss and hope such an event can inspire as well as the one told by the Cleaves family of Hermosa in their letter to the editor printed on this page. The family thanks their “Hot Shot” heroes for their exceptional efforts on the line. Whether you hold a shovel or a radio, a highway sign or a laptop computer, if you have played a part in battling the 416 Fire, all of a community’s heartfelt thanks extend to you.